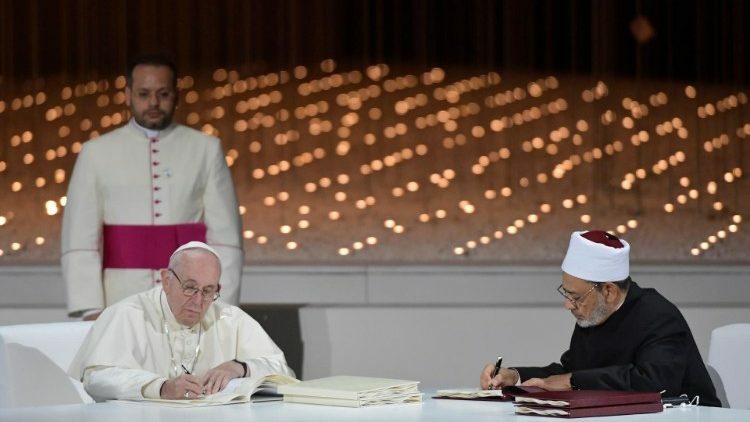 On Monday night, Sheikh Ahmed al-Tayeb, the head of Sunni Islam’s highest seat of learning — Al-Azhar University in Egypt, urged the Middle East’s Muslims to “embrace” local Christians when he and Pope Francis addressed a gathering of religious representatives after signing a “Document on Human Fraternity for World Peace and Living Together“. The document calls on leaders of the world to work together to “spread the culture of tolerance” and to “intervene at the earliest opportunity to stop the shedding of innocent blood and bring an end to wars, conflicts, environmental decay and the moral and cultural decline the world is presently experiencing”. Al-Tayeb also called on Muslims in the West to integrate into their communities while maintaining their identities. The pope, on his first official visit to the Arabian peninsula, called for a halt to wars in the Middle East and said the “fateful consequences” of violence could be seen in Yemen, Syria, Iraq and Libya. The following day, Pope Francis conducted an outdoor Mass for some 135,000 people at the Zayed Sports City stadium in Abu Dhabi. On Monday, Iraq’s President Barham Saleh rejected Donald’s Trump’s suggestion that the United States would maintain a military presence in Iraq in order to watch over neighboring Iran. On February 3rd, Trump told CBS, “We spent a fortune on building this incredible base. We might as well keep it. And one of the reasons I want to keep it is because I want to be looking a little bit at Iran because Iran is a real problem.” Saleh responded: “Don’t overburden Iraq with your own issues. The U.S. is a major power, but do not pursue your own policy priorities, we live here.” The Al Asad airbase, located northwest of Baghdad in Anbar province belongs to Iraq but currently allows American troops who have assisted in the fight against ISIS under an agreement. 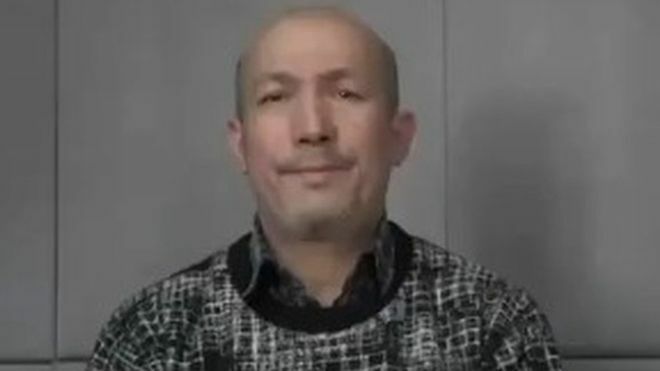 Saleh noted that under 2008 US-Iraq Strategic Framework Agreement, Washington had agreed not to use Iraq “as a launching or transit point for attacks against other countries.” Iraq and Iran share religious, cultural and economic ties, which has been a point of contention for the Trump administration that wishes to isolate Iran as much as possible. On Friday, Canada announced it will take in 750 refugees from Libya, some rescued from migrant detention centers. Immigration Minister Ahmed Hussen said in a statement that Canada had already resettled more than 150 people, with another 600 anticipated to arrive in the next two years. Two years ago, CNN revealed video footage that showed migrants being sold into slavery in Libya, some for as little as $400 each. It caused an international outcry, with the UN Security Council condemning the sale of migrants as “heinous abuses of human rights.” Libya is a major transit point for migrants from Africa on their way to Europe, but they are vulnerable to exploitation, abduction, detention and torture. 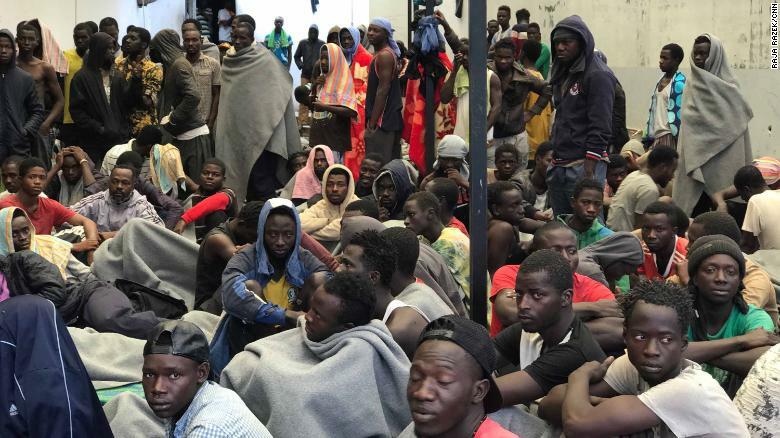 There are an estimated 4,900 refugees and migrants still held in Libyan detention centers, including 3,600 in need of international protection, according to UNHCR. “They’re enduring nightmarish conditions,” said a UNHCR spokesman. Last year more than 2,000 migrants died attempting to cross the Mediterranean to Europe. On Saturday, Algeria’s ruling party, FLN, announced that it had picked President Abdelaziz Bouteflika as its candidate for the April 18 presidential election. Bouteflika, 81, who has been in office since 1999 but has been seen in public only rarely since suffering a stroke in 2013 that confined him to a wheelchair, is likely to win a fifth term as the Algerian opposition remains weak and fragmented. Bouteflika’s poor health had led to months of uncertainty about whether he would stand for election again. His reelection will provide short-term stability for the elites of the FLN, the army and business tycoons, and postpone a potentially controversial succession, but the octogenarian must find a way to connect with the North African country’s young population, almost 70 percent of which is aged under 30. He remains popular with many Algerians, who credit him with ending the country’s long civil war by offering former Islamist fighters amnesty. The opposition says he is not fit to run again and several candidates, including a retired general, have said they will challenge Bouteflika.